Guess what I bought my girlfriend on Feb 14? Ordinary mortals buy roses for their beau on Valentine’s Day. Sons of the soil buy TV news channels. Well, that’s what Bangalore Mirror, the tabloid from The Times of India stable is reporting. Former Karnataka chief minister H.D. Kumaraswamy, son of the former prime minister and “humble farmer” H.D. Deve Gowda, already runs a general entertainment channel called Kasturi through his legislator-wife Anitha Kumaraswamy. 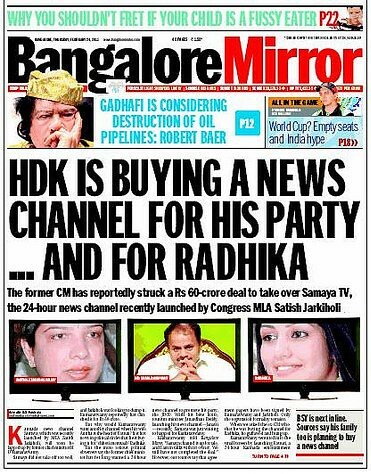 HDK is now reported to have bought the struggling 24×7 Kannada news channel, Samaya, for Rs 60 crore, as a “gift” for chhoti memsaab, the former movie actress Radhika. When we asked the ex-CM whether he was buying the channel for Radhika, he guffawed and hung up. Kumaraswamy, a former film producer, no longer makes the pretence of keeping his relationship with the actress secret. The two have appeared as a “couple” in religious ceremonies. Kasturi channel has already begun running “Coming Soon” promos of its news channel—tentatively titled Newz24. The rumour is that a former print journalist reported to be close to Kumaraswamy and currently heading a news channel is likely to take charge of the news channel operations. Samaya, launched by Congress MLA Satish Jharkiholi, has been struggling since launch. Former Suvarna News editor Shashidhar Bhat recently joined the channel but what happens to him under the new owner will be breaking news. The change of ownership of Samaya is only the latest evidence of a massive shakeup in Kannada media in which big money, with the tint of politics and business, is beginning to shape the public discourse in Karnataka like never before, no questions asked. Last week, tourism minister N. Janardhana Reddy—one of the infamous Reddy brothers—recently launched a news channel called JanaSri. This entry was posted in Issues and Ideas, Kannada & Karnataka, Media, Mysore-Bangalore and tagged Bangalore Mirror, Churumuri, H D Deve Gowda, H D Kumaraswamy, H.R. Ranganath, Kannada Prabha, Kasturi, Newz24, Radhika, Ravi Hegde, Sans Serif, Suvarna News, The Times of India, Udaya Vani, Vishweshwar Bhat. Bookmark the permalink. ← The most idiotic commercial of the year (so far)? what a special gift to have from the son of the soil.if son of the soil can by a news channel for his chhoti memsaab, in acountry like ours, we will have to search poverty with alamp inthe hand at noon. I wonder if Kasturi is making any profit. Samaya, reeling under losses, is being sold off. Is this a good business decision? Or is the power of love so strong that it is affecting Kumarswamy’s business taking decisions? Great going Mr. Kumarswamy, Samaya is a future CNN in the making…. Sir, our own AOL -Time Warner, start up capital provided by a politician/gani dhani, M&A by another politician/gani dhani. This transaction will be predominantly in cash, no fat cat investment banker will get any bonus….. When is Yeddy launching KAMALA TV ??? Sir, do you know how old that channel is?, were you expecting it to break even from the first month of operation?, do you know how much money Radia’s favorite channel NDTV lost in last quarter? People do buy loss making media outlets, I think it is a great investment call by Shri Kumarswamy. If you have some spare cash and a girlfriend like Kumarswamy, you should buy a channel or two for her, whether channels are making money or not. You do know what the power of love is like. Imagine for a moment – had Rajmata and Yuvraj been in serious trouble, say in some criminal charge, wouldn’t you surrender before the police and take the blame on your own head? Working as per constitution. Equality to all in the family! Another Karunanidhi family fortune in the making in Karnataka in the form of Gowda giri.! Good for the Corrupt Congress party! I protest. The humble farmer and his humble son, Deve Gowda and HDK, represent the vanguard of secular-left-progressive forces. They are the only hope of the weaker sections of society. They stand athwart the charge of the majoritarian communal corporate brahminical Hindu(tva) hordes led by hte Sangh Parivar crazed BJP. Just as the “poet” Karunanidhi and his “poetess” “daughter” Kanimozhi in neighboring Tamil Nadu have shown, a combination of left-secular-minoritarian groups can always triumph over majoritarian led brahminical forces. when since brahmins become majority ???? don’t worry they will soon vanish from india. india – brahmins = poverty… this equation is here to stay and you will soon see it in action. to say frankly there are no good leaders in Karnataka, it all starts frm poiint when a famer got bribed to cast his vote. From where a politicion shd bring money so he ll start looting when his chance comes this is cycle which repeats in our grt India…. In this busy schedule our ministers want some relax out of people.. thats where 2nd families r prevailing…. due to some technical and economical reasons.,.. Mr Kumar swamy u did a grt job enjoy with ur girl… who is bothered about people.. have some handful money… enjoy maga enjoy..
@kaangeya – politics of our time dude. Chillax :D Are you saying we ought to feel sorry for the maj.led.brahm.forc? Your sympathies are misplaced. Or insist upon a condition saying that for every politician setting up his media machinery he/she has to have one editor from the enemy camp. :) Impossible, I know. Ideas anyone? In a democracy, we cannot afford news to be reduced to mere propaganda. But since that seems to be happening all too often, I suppose our democratic credentials have gone for a Sehwagian toss. What is even more terrifying is Gaddafi’s plans. Help! Would it be that case with you if it were Bhogmata and MineRaja? Prophetic words:) But I still nurse my skepticism, sorry. The nouveau politico-capitalists would certainly play the investors as this case shows. But will they be harbingers of big scale employment and wealth generation for many? I still doubt it but will be glad if I am proven wrong. Any thoughts on Jana-Shri channel and Suvarna? Would be good for non-corrupt BJ Party? Yen janaanappa. Ondu TV channel kodsidakke eno olle Vidhana Soudhaane kodsbitta anta matadtaaralla. Paapa… hanebaraae ishtu. Why poach anchors from other channels when you have your trusted lieutenant — YSV Datta! Please rehabilitate him with a 24×7 role, so that we can at least change the channel and live peacefully. I’d welcome a similar offer for Mr Ugrappa too. >Politicians owning news media is a sad compromise of the Freedom of Speech. We are fine as long as people know who owns what. This is much better than DD owned by the govt. Ban is a typical Stalinist solution. Office holding politicos can buy the media in exchange of Padmas/money/jaunts/sites/single malts/etc, alternatively they can hire people like Radia or both. For politicians media is a business/investment avenue and our politicians know how to separate business from their politics. No, I detest the MineRajas and Bhogmata. Did you hear – Yuvraj came over to Kodagu a couple of days back to ‘relax’. Cool life, huh? Doesn’t even have to wait for a weekend to relax! Admit it now, your heart pines to visit Kodagu and serve Yuvraj, isn’t it? Wonder how he explains the money paid for the channel. Does the IT ask any questions? Stop publishing articles about this looter family and publish something useful. Anant Pai who started the Amar Chitra Katha series of Comics died in bombay yesterday and there are generations of people who have grown up with these comics which moulded their personality and taught them about glory of India and Indians. Request Churmuri to publish something about Anant Pai and Amar Chitra Katha as a homage to this great soul. Poor Gowda and kins. they were the poorest of the poor in Hassan. Now they want to come up in life with hard work. Why people are jealous of them. Let the Gowdas alone for Gowda sake. This doesn’t applies to all! Yes it doesn’t. This applies to so called humble farmer called HDD’s family. You cannot compare with others. HDD & his family has looted our state wealth. Now buying such a channels that too for a keep is not wondering. Has any one watched the News on Kasturi. It is sickening the way they glorify mannina magana maga! Now Samaya will go the same way. Yaaraddo duddu, Kumaranna na jaatre! !